Members of the Child Abuse Prevention Council spend their Wednesday afternoon putting out blue pinwheels at Region V.
Council member Karla Rosendahl, who is also the home visitor for Healthy Families Nebraska, decorates Region V's grounds with blue pinwheels on Wednesday in conjunction with Child Abuse Prevention Month. The Child Abuse Prevention Council arranges 200 blue pinwheels in conjunction with Child Abuse Prevention Month on Wednesday afternoon at the Region V office. 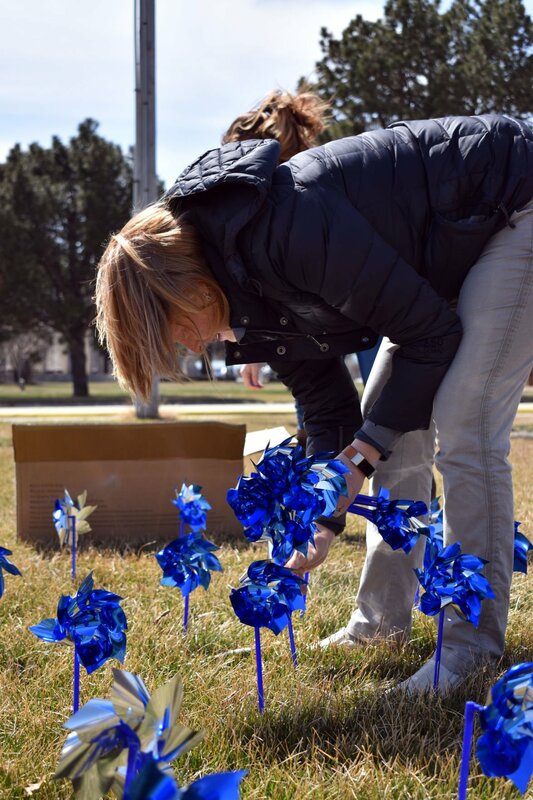 COLUMBUS – The Child Abuse Prevention Council of Columbus gathered on Wednesday afternoon to place approximately 200 blue pinwheels in conjunction with Child Abuse Prevention month at the Region V office. “There is a very big need so that the community is aware of those families that struggle,” said council member Karla Rosendahl, who is also the home visitor for Healthy Families Nebraska. Rosendahl believes that children of all ages are at risk for abuse, regardless of their families’ economic status. “I don’t think we as parents sometimes realize the importance of social and emotional development at a very young age and the connections that children benefit from,” she said. Approximately 1,750 children died from abuse and neglect in 2016 and nearly 700,000 children are abused annually, statistics from the National Children’s Alliance shows. Region V is a non-profit organization driven by community involvement, and Hein believes that this is a great way to stay connected. Council members have been decorating the yard outside of the office since before the organization was established in 2014. The building previously housed the Columbus Area Chamber of Commerce. Along with pinwheels, the council also developed a sizable display. They’ve placed pinwheels and displays at the East Central District Health Department and the Columbus Community Hospital’s daycare this year. April is the official month of Child Abuse Prevention and blue is its official color. The Council kicked off the month by placing blue "Pinwheels for Prevention" around Columbus. Due to Nebraska’s proneness to strong winds, the council decided to place some pinwheels in mason jars to be displayed indoors. The council receives funding from Nebraska Children and Families Foundation. The foundation provided 480 pinwheels to be distributed. There are an average of seven council members made up of parents and representatives from various organizations, such as Head Start and the health department. Every year, the council holds the Travelling Plaque competition among local businesses and wanted to involve more schools this year. On April 13, participants are encouraged to compose a creative social media post relating to Child Abuse Prevention Month on the council’s Facebook page with the hashtag, #wearbluecolumbusne. The local business with the most creative social media post will have its name engraved on the plaque. The winner will also be awarded the plaque for a year. The winning school will receive a $100 gift card to be used to benefit children in need. Members of the hospital will be dressed in blue on April 13, as well. “Every child deserves a great childhood,” Rosendahl said.